Radio Program interviews some LifeRing members on “Body Language”, produced by Christopher Springmann on RadioMD.com, October 12. 2012. See producer’s website. Interview with LifeRing CEO Robert Stump. Interview with LifeRing Chair of the Board Craig Whalley and Robert Stump. Interview with LifeRing convenors Gillian E. and Emily M.
Port Angeles bookseller leaves to run recovery organization, in the (Washington State) Peninsula Daily News, July 27 2010. Features newly elected LifeRing Executive Director Craig Whalley and gives a basic description of what LifeRing is about. Read the story on the paper’s website here, or as a PDF here. Talk Shop, by Joseph Potocki, in the North Bay Bohemian, Sept. 17 2008. “LifeRing seems birthed from the prototype world of the rugged Western individualist. Religion isn’t really the issue. In fact, a significant number of its members are regular churchgoers…. Likewise, 12 Step programs aren’t at issue. Some ardent LifeRingers also regularly attend 12 Step meetings. Rather, it’s LifeRing’s emphasis on envisioning, building and traveling down one’s very own life path which sets it apart. This seems in harmony with that old-fashioned American notion of DIY adventurism and mythic questing. But instead of Lewis and Clark conquering a vast Western wilderness, or some modern-day, Horatio Alger striving to build financial empires, LifeRing embraces broken-down folks who are questing to conquer their addictions.” — Read full article as PDF. 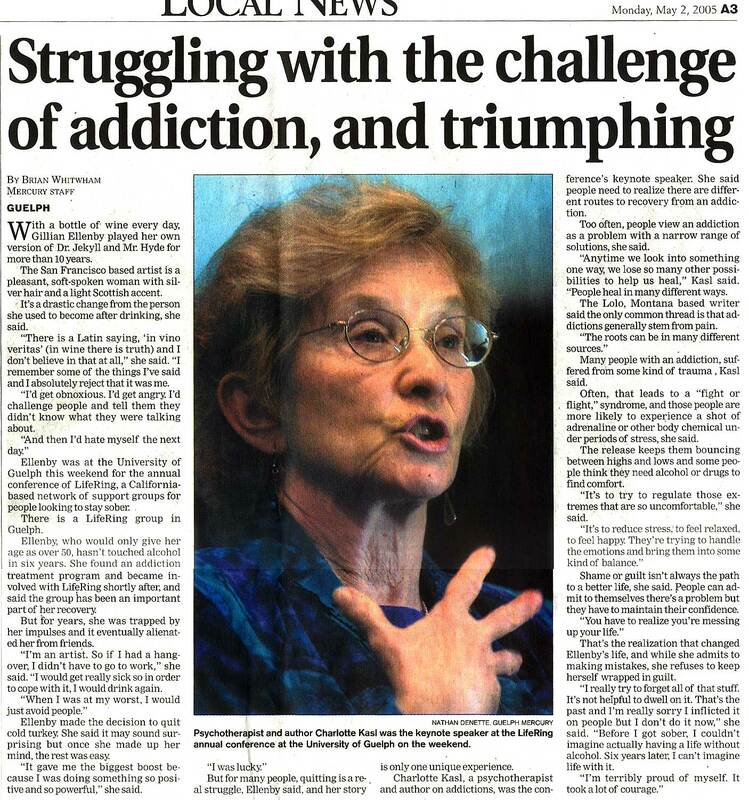 Secular Program Tackles Addiction, by Sara Stroud, in the Vallejo Times-Herald, March 13 2008. “How was your week? It’s a simple question, but for one substance abuse recovery group with meetings in Benicia and Vallejo, it’s also a touchstone that keeps members coming back to share their small victories and setbacks in their struggles with addiction…” Click to see the whole article. “Recovery for the Rest of Us,” East Bay Express, 1/18/06.”Despite all assurances that ‘higher power’ can mean anything they want it to mean, some still find the twelve-step language chillingly churchy.” Describes LifeRing as “a non-twelve step program based on cooperative, positive reinforcement with no religious dimension and with dozens of weekly local meetings.” The Express is a weekly freebie published in the San Francisco Bay Area and owned by Village Voice Media Inc.
“LifeRing offers an option in recovery,” Contra Costa (CA) Times 12/23/04. “In the Bay Area, hundreds of men and women in recovery have found help getting through the holidays — and the rest of the year — through LifeRing, a support group that offers a nonreligious alternative to Alcoholics Anonymous.” The Times is a daily newspaper, a member of the Knight-Ridder chain, serving a large, mainly suburban area east of San Francisco. Nanaimo Daily News Nov. 11 2006. Story on local LifeRing meeting featuring Jack McNeil and other LifeRing participants. PDF. Media coverage for the 2005 LifeRing Congress held in Guelph, Ontario, was very good. Unlike most of the US media, the Guelph media recognized a news story with a human interest angle when they saw it. Guelph Mercury, Jan. 17 2005: Advance story featuring interview with Congress organizer Jason Kelly. PDF.